A water wonderland for all the family. Explore and discover a wide variety of sea creatures and learn about their habitats. From guided talks, feeding time to kid’s birthday parties, Blue Reef Aquarium has a lot to offer. With over 25 activities and rides, including F1-Karting, battle boats, mini golf and water walkers to name a few, Holywell Bay Fun Park is a hub for things to do. Enjoy a great day out for all the family. Located just a few minutes drive south of Newquay. Catering for all types and sizes of groups from families to stag and hen parties. Secure lockers and great facilities. Choose from a variety of packages and games to maximise your experience. If you are planning a stag weekend in Newquay St Eval Go- Karting track is worth investigating. Purpose built tracks, high powered karts and great facilities make for a fantastic few hours racing with your friends. Good group discounts and easy to find and not far from Newquay, many stag parties enjoy a surf lesson in the morning and Go –Karting in the afternoon. If getting muddy and challenging your friends whilst racing around outside on a quad bike is your idea of fun, then the ATV Centre near Truro is the place to go. With a huge selection of quads and some epic circuits and large tracks this really is the real deal of quad biking. They supply all the safety kit and offer beginner tuition or something a little more exhilarating if you have some previous experience. Without a doubt Cornwall’s largest and most interesting attraction. The Eden Project is a must see for families and couples. The Eden Project captures learning, nature and adventure all under one roof. From large rain forests, contemporary gardens, summer outdoor concerts to adrenaline zip lines this really isa fascinating way to spend the day. The coastline that surrounds Newquay is known for its dramatic cliffs, rolling seas and fabulous surf beaches. 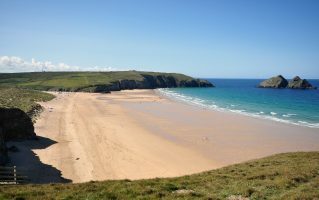 Not far from Newquay you will discover Bedruthan Steps, an impressive tidal beach that can only be explored at certain times of the tide. Conquer the near vertical chizz led out steps to explore the hidden caves and wonders of the Cornish coastline. For those wild at heart a trip to Newquay Zoo is perfect for animal lovers. Get up close and personal with animals of all shapes and sizes. With over 130 species including big cats to lovable meerkats, visit the tropical house or help out with Lemur feeding time there is lots to see at Newquay Zoo. Just a 20 minute drive from Cornish Wave in Newquay, drive north out of Newquay towards Wadebridge. Enjoy easy bike hire and choose the length of your ride. Maintained cycle paths make it easy for all walks of life to enjoy the scenic views of the North Cornish Coast. If you make it Padstow a must is to seek out Rick Stein’s fish and chips. Ideally suited to children 2-10 years old. Dairy Land has a wide selection of farm based activities such as tractor rides, outdoor trampolines and a massive indoor play area. Suitable in wet weather this could be the rainy day out that you’re looking for. A warning label comes with this. If you haven’t heard of Cornish rattler and you’re a fan of cider then you must give this a try. Either visit their refurbished visitor centre or buy pint or two in Newquay’s bars. Originally distilled at a ridiculously high percentage Cornish rattler is marketed as the cider with a bite. The home of rattler Healeys Cider farm is around twenty minutes from Cornish Wave Surf School in Newquay. If you intend to visit for some tasting make sure that you have a designated driver. After enjoying a Cornish Wave surf lesson or coasteer session and you still have some energy left, Cornwall’s Crealy Adventure Park is a great little theme park not far from Newquay. A typical theme park with some great Cornish flavours you’ll be spoilt for choice on which rides or entertainment shows to visit. Home to Slide and Glide surf boards. Lee runs an authentic surf shop in the heart of Newquay that has all a surfer could want. Stand Up Paddle Board specialists, Lee has got you covered with advice, lessons and rental. Needing to sell a surfboard or wishing to buy second hand models this is the place to go. First opened in mid-2012, Watershed surf shop in Newquay aimed to offer customers niche surf products, clothing and surf boards. Now stocking their own Watershed brand along with more recognised established surf brands, Watershed has successfully captured a section of the surf retail and hardware market in the UK. With a huge range of surf boards in all shapes and sizes, Adams is a long standing local surf board manufacturer based in Newquay. Home to the Newquay wing of the Bodyboard-Depot, this is a must visit surf shop for your surf or bodyboard needs. Big ranges of boards, wetsuits, fins, leashes and surf hardware can be found here. Long standing Newquay surf shop Custard Point has been shaping, advising and selling surfboards and hardware since 1983. With a large stock of retro, mini mal’s, eggs, alternative shapes and Stand Up Paddle boards produced to be ridden in UK waters, Custard Point is a must to pop into when in Newquay. Check them out for surf board, SUP and kayak rental this summer. Whiskers is a great little coffee shop by day and a lively boutique bar by night. They boast home made locally sourced produce and their very own coffee bean Morale. Organic wines, local craft beers & ciders topped off with live music are on the menu each evening. With open mic night every Monday, fantastic live music on Wednesdays and funky DJ’s at the weekend Whiskers is a great place to catch some good music whilst enjoying a good drink. Super friendly staff caters for all dietary requirements and you can even bring your dog. Pizza, pie, ciders and a stunning location. A fairly new addition to Newquay, The Stable prides itself on classic West Country foods and houses one of the largest selections of ciders known to man. Enjoy taster trays of weird and wonderful ciders or relax with one of your favourites whilst enjoying the panoramic view of Fistral beach. Time your visit as the sun sets over the Atlantic for a really special start to your evening. If fancy a little ice cream refreshment then the Moo ice cream bar is the place to go. Located right in the centre of Newquay, Moo ice bar offers a big variety of refreshing smoothies, milkshakes and of course delicious clotted ice creams. Located right next door to Slide & Glide surf shop, The Beached Lamb has been a favourite for breakfasts and lunches to locals and visitors alike. Pop in for some home cakes and relax with a coffee as you watch the world go by. A great place to laze away some hours before you hit the surf at Fistral beach or enjoy a unique coasteer session with your friends. One of the oldest and friendliest drinking establishments in Newquay. The Red Lion pub offers great views over the Newquay Harbour and serves classic pub food accompanied by local Cornish ale. Live bands on Friday and Saturday nights make for an entertaining evening. Easily the best Bar/Restaurant in the area. The Lewenick lodge offers unrivalled views with amazing food and service. Drop in for a quick drink and game of pool as part of a coastal walk around Newquay, some light lunch or a special evening meal. Children and dogs welcome.